This entry was posted in Gear Tests and tagged best backpacking bra best hiking bra best trekking bra Panache trail running bra on September 27, 2018 by Laura P.
A high-impact sports bra is necessary for running and trail running in particular as the uneven terrain and steep hill sides can add even more bounce to your step. For each running stride you take without a supportive sports bra, your breasts will bounce in a horizontal 8-figure motion, moving as much as one inch for an A cup and up to three inches for a D cup. Besides the immediate discomfort that especially more well-endowed women will feel, such “unsupported” high-impact activities can lead to damages on the breast tissue which can cause drooping and sagging. Running and other high-impact activities. 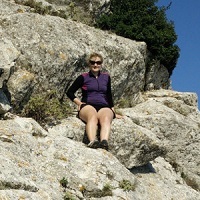 Hiking and climbing (if you prefer maximum support). The Panache sports bra is made out of moisture-wicking stretch microfiber and breathable mesh which feels smooth and non-abrasive upon your skin. The lightly padded cups support each breast individually by the help of silicone encased underwires. Also the 3-column, 3-row hook-and-eye back closure is cushioned to prevent any chafing or irritation. 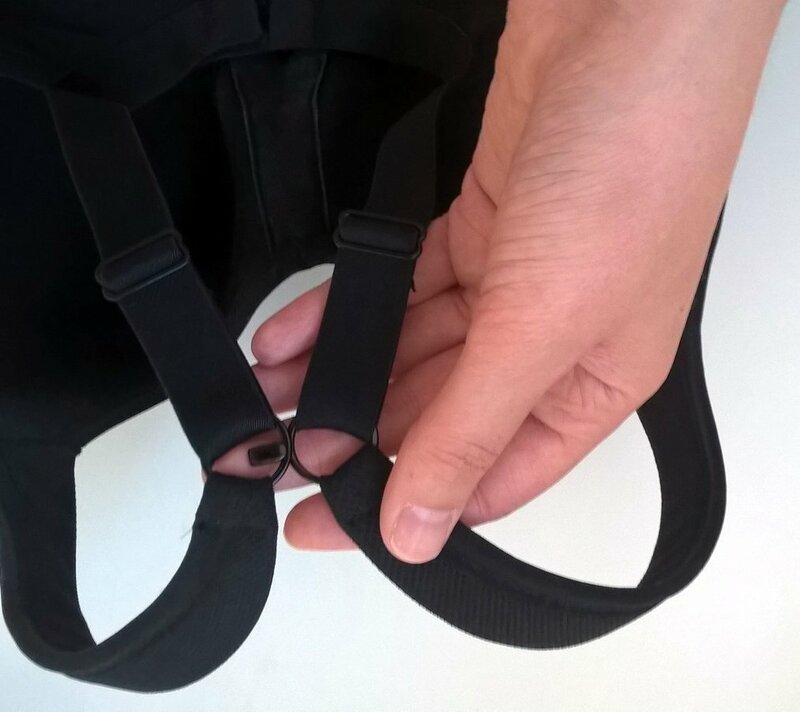 The wide elastic shoulder straps are padded to reduce the pressure and possible discomfort while being adjustable in the back. The straps can also easily be transformed from running straight up and down into a kind of racerback (for better freedom of movement) by using the J-hook converter so the back rings are hooked onto each other. The Panache sports bra is always available in black, white and grey-tone, but every year also in two new more vibrantly colored limited editions. Online you can be lucky to find a previous limited edition in your size while physical shops will often merely have the current limited editions available along with the three classical versions. Except for shoes, there is probably no other piece of apparel where fit is as important as for a high-impact sports bra. Unlike low and medium support sports bras which usually are shelf bras (compression bras) that you can shuffle your bits and pieces around in, high-impact sports bras mainly use encapsulation (sometimes in combination with compression) where each breast has to be encapsulated by a supportive cup – that of course has to fit. This is also the case for the Panache sports bra and the brand takes perfect fit so seriously that they provide no less than 65 different sizes, starting at 34B and up around J-cups. According to Panache’s sizing scheme I should be between 32D and 32DD and I decided to go with the larger as my “normal” bra size is a European 70E, which converts to a 32DD/E in US/UK sizes. Looking back, I should probably have gone for a 32E (or maybe even 32F) as Panache’s 32DD is a tiny bit too small for me, but I had already torn off the tags when realizing it… Nevertheless, I am very happy with the support offered by the Panache sports bra. According to the brand’s own research it reduces bounce by 83%; by my own estimates I would also say that bounce is reduced with something around three quarters. It is thus very comfortable to run in due to the high level of support, but at the same time not so restrictive that you want to tear it off your body the second you get home. 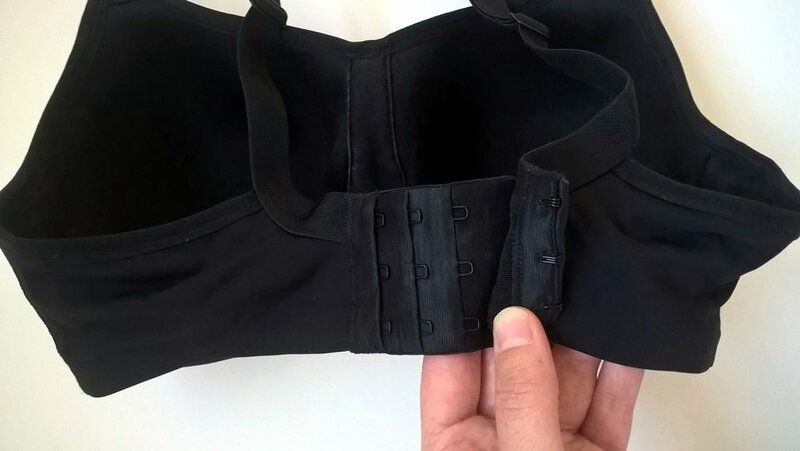 Due to the slightly small size it was, however, impossible for me to use the J-hook converter to transform the back straps into a racerback as my breasts went from slightly bulging at the sides of the sports bra into being uncomfortably squeezed and spilling over the edges whenever I tried this option. 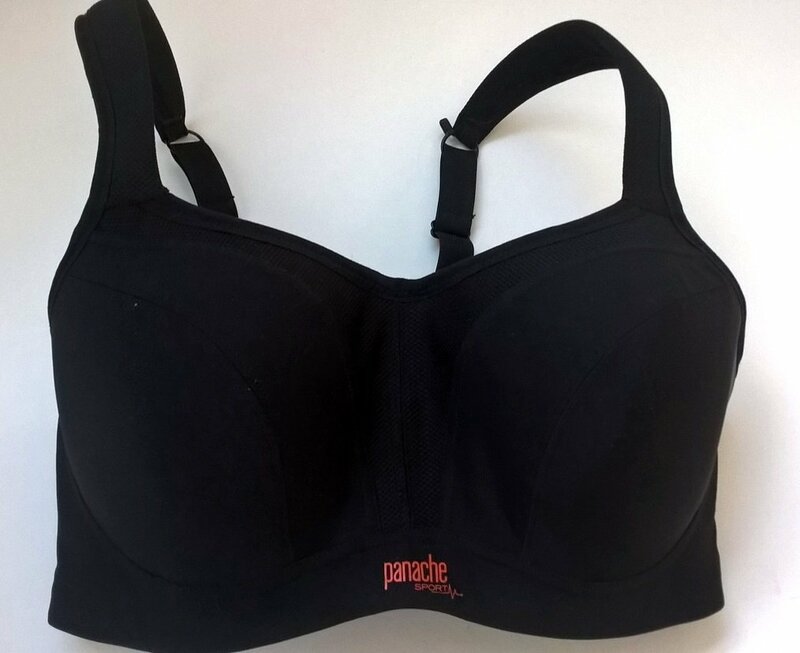 The Panache sports bra should be handwashed and hung up to drip-dry, but I have to admit that I have also washed it in the machine at a cold gentle cycle, neatly wrapped in a pillow case. I never tumble-dried it though, but there has also been no need as the sports bra dries very fast. I tested the Panache sports bra on my semi-daily runs around the hilly countryside near my home and I was very pleased with its performance in terms of support (even if I could have used a half cup size bigger), comfort and moisture-wicking abilities. The latter means that I have yet to detect any kind of bad odor in the bra and thus wash it for hygiene rather than stench. The high level of support that the bra delivers also means that it feels too restrictive (for me) for hiking where the tempo and strain on the chest are so much lower. I would personally go for a medium support sports bra or tank top with built-in bra for such activities. Women with larger breasts might, however, appreciate the high-impact support that the Panache bra offers in any case. I would thus recommend the Panache Sports bra to any woman for running and especially trail running, but also for low and medium impact activities such as hiking and climbing if you just prefer that extra support. ← Why should you wear quick drying clothes for hiking?